I still can't believe I am a geezer enough to be a double great grandfather. But truly that is the case and the two great granddaughters are gems. Fortunately they live close enough for us to visit and see first hand their progress. The magic of Facebook with modern parents gives us almost daily updates on their development but there is nothing like an hour or two with them. Sunday we had chance to visit Keelin and her parents in Binghampton. Keelin is the daughter of grandson Tamdan and his wife Haley. They both have busy, busy lives but were gracious enough to give up some Sunday time for our visit. Keelin was awake and happy when we arrived and I held her for a while until she became a bit fussy. I am skilled at a number of things but the maternal side is underdeveloped so she ended up being handed off to Nancy. Although Keelin remained alert for a while sucking on her pacifier, it wasn't long before she was sound asleep. See photo below. 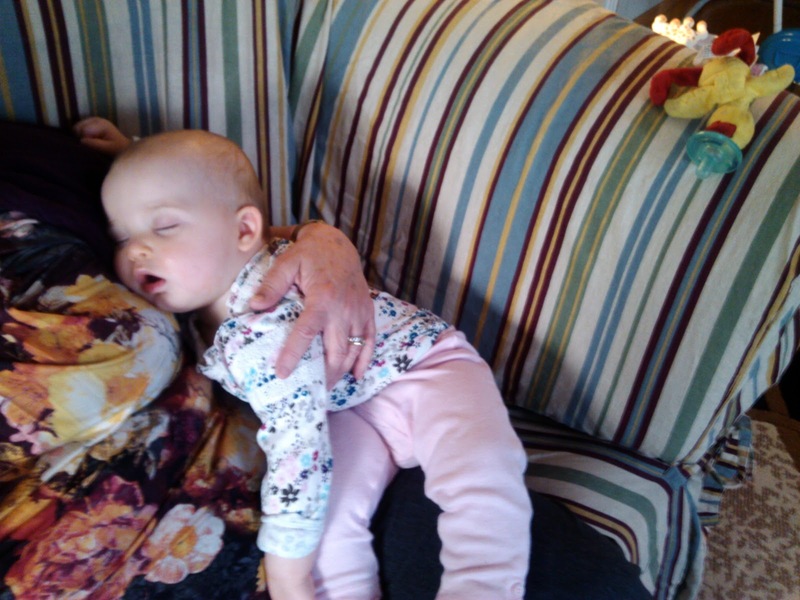 Ah well, for those of us more senior folks that suffer frequent sleep interruption, the sight of the pure contentment of a sleeping baby is a gift. And yes it is wise to let sleeping babies lie!